“Life as working woman is tough, especially if one want to get to the top. One has to work harder than most men and still be the one who runs the show at home. 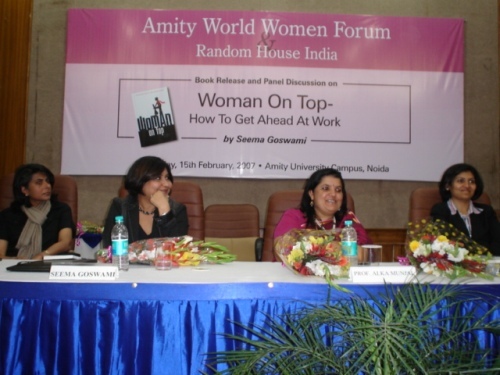 One will not only be judged by individual performance but how one looks will also affect the grade” says Ms. Seema Goswami, author of the highly acclaimed book “Woman on top – How to get ahead at work”. Ms. Goswami was present at Amity University Campus to discuss the finer points of her book and to lead a panel discussion on the same topic as of the title of the book. Ms. Goswami is well known columnist and journalist. During the launch of the book at Amity Campus, a panel discussion was held by power pack women from diverse fields including Ms. Anjana Bhargava, Textile Designer, Dr. Shikha Sharma, nutritionist, Ms. Shipra Jha, Director, OXFAM (South East Asia) sharing their personal experiences and educating the audience on the importance of developing all aspects of one's personality. Dr. Ashok K. Chauhan, Founder President, Ritnand Balved Education Foundation was present during the occasion. Ms. Anjana Bhargava, Textile Designer talked about perfect dress code for work and said that if one works in a corporate office, one must see that the dress one wears is fit enough to go for official meeting, within the office or outside the office. One must not feel embarrassed while meeting clients because of inappropriate dress. Ms. Bharagava said that old perception of saree as the most accepted office wear is changing and advised the audience for choosing perfect occasion for wearing sarees. Dr. Shikha Sharma, nutritionist said that health is the most precious asset and to fit physically, one should take healthy, nutritious food in proper quantity. Skipping food on account of work is an alarming tendency spreading across cities. It should be avoided as one has to spare some time for food. Dr. Sharma discussed about various exercises, general health and physical issues that women faced in every day working. Ms. Shipra Jha, Director, OXFAM (South East Asia) appreciated the work of Ms. Seema Goswami and said that the content is very contemporary and every woman whether working or not should read this book. Ms. Jha said that with more and more Indian women taking up full-time career, it has become increasingly important to address issues they face at workplace – from what to wear to work or how to deal with sexual harrassment, from how to negotiate a pay rise to how to handle difficult boss. Dr. Ashok K. Chauhan, Founder President, Ritnand Balved Education Foundation, said that it is a right time to salute the Indian women, for the success, fame they are getting in every sphere of life and work. 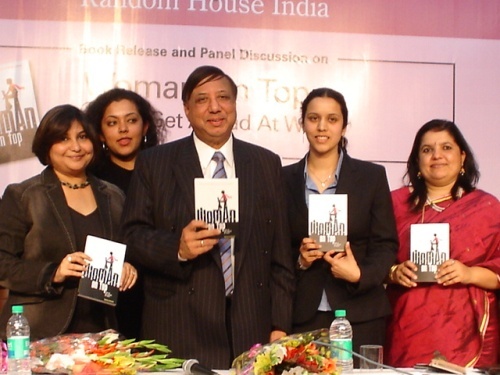 The book written by Ms. Seema Goswami is a good attempt to help upcoming women entrepreneurs in different sectors. Dr. Chauhan said that a quiet revolution is going on. A large number of professionally qualified women under the age of 25 are entering the workplace. 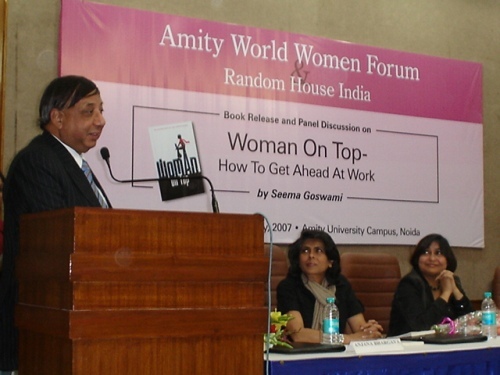 Dr. Chauhan said that Amity had taken initiative by establishing Amity World Women Forum with an objective to address the topical issues concerning women at personal, professional and domestic fronts. 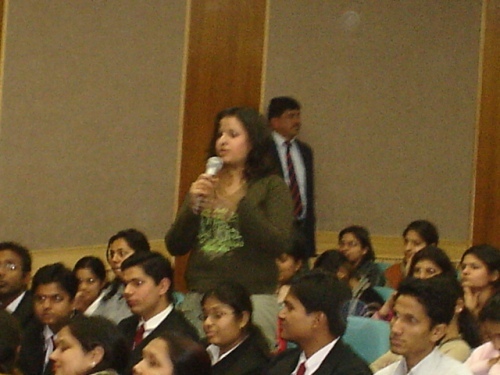 The event was attended by faculty of Amity Institutions of Amity University. Ms. Seema Goswami was available for institute readers and personally signed copy.